If you find yourself stranded in the outdoors or if you have to venture out to find food in the wild, you are either one of the “lucky” (prepared) ones with the necessary equipment and tools to fish and catch your next meal, or you’re starting with a blank slate. This page is for those who didn’t prep up and don’t have the required gear. For you, it may be necessary to craft and improvise your own fishing tools and equipment, in order to successfully catch your next meal . 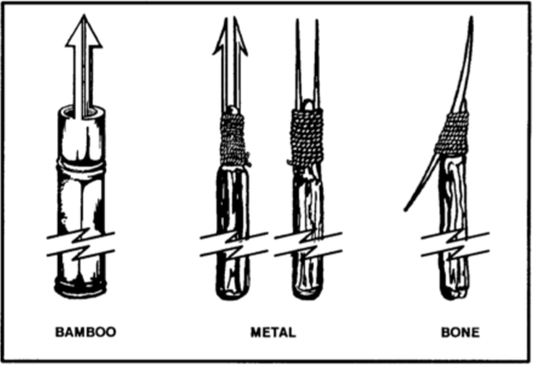 You can make field-expedient fishhooks from pins, needles, wire, small nails, or any piece of metal. You can also use wood, bone, coconut shell, thorns, flint, seashell, or tortoise shell. 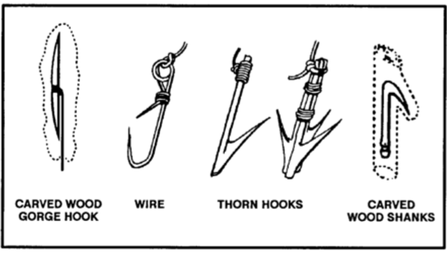 You can also make fishhooks from any combination of these items. A stakeout is a fishing device you can use in a hostile environment. To construct a stakeout, drive two supple saplings into the bottom of the lake, pond, or stream with their tops just below the water surface. Tie a cord between them and slightly below the surface. Tie two short cords with hooks or gorges to this cord, ensuring that they cannot wrap around the poles or each other. They should also not slip along the long cord. Bait the hooks or gorges. If a gill net is not available, you can make one using parachute suspension line or similar material. 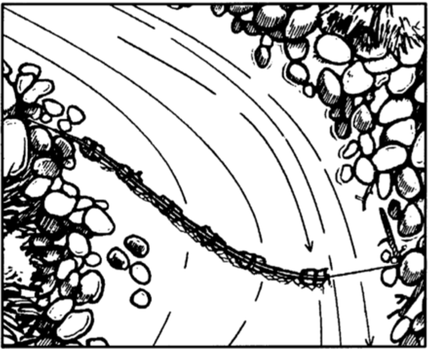 Remove the core lines from the suspension line and tie the easing between two trees. 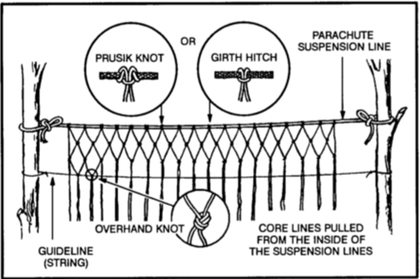 Attach several core lines to the easing by doubling them over and tying them with prusik knots or girth hitches. The length of the desired net and the size of the mesh determine the number of core lines used and the space between them. Starting at one end of the easing, tie the second and the third core lines together using an overhand knot. Then tie the fourth and fifth, sixth and seventh, and so on, until you reach the last core line. You should now have all core lines tied in pairs with a single core line hanging at each end. Start the second row with the first core line, tie it to the second, the third to the fourth, and so on. To keep the rows even and to regulate the size of the mesh, tie a guideline to the trees. Position the guideline on the opposite side of the net you are working on. Move the guideline down after completing each row. The lines will always hang in pairs and you always tie a cord from one pair to a cord from an adjoining pair. Continue tying rows until the net is the desired width. Thread a suspension line easing along the bottom of the net to strengthen it. 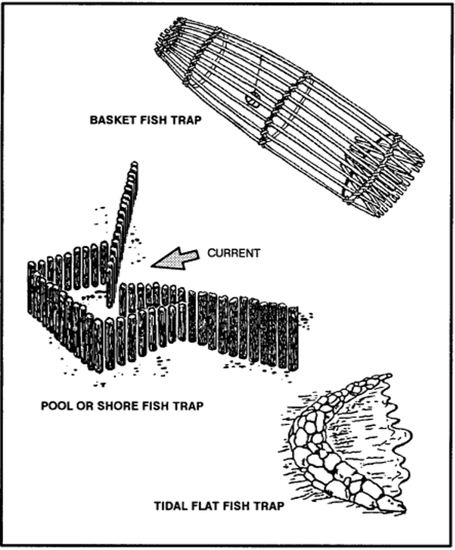 Use the gill net as shown below. If you are near shallow water (about waist deep) where the fish are large and plentiful, you can spear them. To make a spear, cut a long, straight sapling. Sharpen the end to a point or attach a knife, jagged piece of bone, or sharpened metal. You can also make a spear by splitting the shaft a few inches down from the end and inserting a piece of wood to act as a spreader. You then sharpen the two separated halves to points. To spear fish, find an area where fish either gather or where there is a fish run. Place the spear point into the water and slowly move it toward the fish. Then, with a sudden push, impale the fish on the stream bottom. Do not try to lift the fish with the spear, as it with probably slip off and you will lose it; hold the spear with one hand and grab and hold the fish with the other. Do not throw the spear, especially if the point is a knife. You cannot afford to lose a knife in a survival situation. Be alert to the problems caused by light refraction when looking at objects in the water.